Name: Charles Rigby; was exposed to and mutated by a hive of superintelligent wasps after contact with an unnamed weapon (No name was ever provided for his transformed state). Time of Origin: Rigby himself came from Earth in 1933; the weapon that transformed him came from the far future, approximately the 51st century. History: While Charles Rigby was not an adversary of The Doctor of his own free will, being mutated by exposure to a powerful and mysterious weapon from the far future that influenced his mind rather than making any of his villainous decisions on his own accord, he was still a significant threat to The Doctor during their confrontation. Originally a simple local dentist from the English village of Marpling in 1933, the most distinctive thing about his past being his memory of the only person he killed during his service in the First World War, Rigby's life was forever changed when he found a mysterious black object in his garden one morning, which he moved into his shed to show to his young friend Liam Jarrow. Unknown to Rigby, the object was a psychokinetic weapon created in the fifty-first century that had been stolen by unauthorised time-travellers, the thieves disintegrating during their escape attempt due to their improperly-programmed transduction beam while the weapon was sent flying backwards until it 'landed' in 1933. A black cylinder made of a molecularly engineered crystal lattice that could hold and isolate certain psychokinetic energies, it possessed a basic artificial intelligence that would control and alter any humans who came in contact with it, spreading this contagion to turn others into living weapons (The Doctor speculated that it was designed as a stealth weapon to be deployed behind enemy lines). While the weapon would have been dangerous under any circumstances, damage it had sustained upon its arrival in the past resulted in it becoming even more of a danger when it 'infected' a wasps' nest in Rigby's shed. Since the weapon had been designed to be used against humans rather than insects, the wasps were thus reconfigured to seek out and infect humans - typically entering through the mouth and nose -, mutating them to seek out, infect, and mutate humans, beginning with Rigby when he next visited the shed and progressing from there (It was never specified why the wasps were able to essentially 'program' Rigby as their first host but had such trouble attempting to program other subjects after Rigby; the most likely explanation is that the wasps and the weapon were able to 'study' Rigby's DNA during the night after the wasps were exposed to the weapon based on skin cell samples scattered around the shed, giving them a better understanding of Rigby's specific DNA and allowing them to 'plan' how to manipulate it, where other humans were more complicated as their DNA differed from Rigby's and the wasps were uncertain how to properly alter them). Although Rigby's mutation was haphazard, it nevertheless followed a pattern of sorts; after the wasps entered his body through his mouth, Rigby's body gradually shaping itself into a wasp-like form, such as his waist narrowing and additional legs growing from his side; towards the end of his life his transformation developed to the point where he grew wings, although the wings never reached a point where Rigby could fly with them. The developing mutation allowed the wasps to improve their understanding of human anatomy for later mutations; their initial attempts to infect others failed as the wasps' victims died of anaphylactic shock or heart failure due to the stings inflicted on them, although Rigby remained primarily a vessel for the weapon's 'intelligence' while the lattice continued to serve as a controlling influence. While most of his victims died of the stings, Rigby was able to 'infect' local spinster Miss Havers with the wasps while retaining some degree of control over the rate of the mutation, with the result that Miss Havers looked and acted relatively normally while Rigby's entire body was twisted and warped into an insectoid appearance, allowing her to act as Rigby's 'spy' to monitor The Doctor's actions against him. 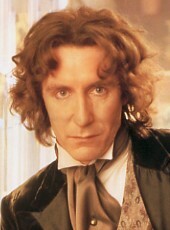 Having learned of Rigby's mutation while holidaying in the village with the local squire George Pink and his brother Hilary, the Eighth Doctor, Fitz Kreiner and Anji Kapoor attempted to investigate the cause of his transformation, but The Doctor's attempt to steal the weapon backfired when Squire Pink learned of The Doctor's planned theft and called the police, resulting in the wasps infecting and killing Hilary. Matters were further complicated due to the presence of a commando team from the far future - sent back in time via a temporal transduction beam -, consisting of team leader Kala, Jode, and Fatboy, with Fatboy being an android who doubled as a nuclear bomb; their primary mission was to recover the weapon, but if containment proved impossible, Kala and Jode were under orders to detonate Fatboy and nuke the entire village within a fifteen-mile radius to destroy it (Their understanding of time travel also appeared to be limited, Kala convinced that detonating Fatboy wouldn't affect her history despite The Doctor's certainty that it would). Making contact with Kala, The Doctor learned more about her role in current events and was able to get a general picture of what she was tracking, soon realising that she was sharing so much with him because she wanted him to give her an alternative to using Fatboy. Using the TARDIS laboratory and a fragment of the weapon, The Doctor was able to synthesise a version of the weapon's psionic wave and encode it into the molecular chains of CO2 in a fire extinguisher, with the result that anything sprayed with the extinguisher would be released from the weapon's influence. Confronting Rigby as he attempted to escape on a train, The Doctor refused to use the weapon he had developed when Rigby didn't harm Liam even after taking him as a hostage, feeling that this example of Rigby's continued humanity proved that Rigby hadn't reached the point where The Doctor could kill him with a clear conscience by defining him as an irredeemable monster. As a mass of wasps attempted to attack the train carriage, The Doctor used most of his modified extinguisher to 'negate' the wasps attacking him, subsequently returning to Marpling to confront Ripley by stealing a tractor. Unfortunately, as he arrived back in Marpling, he discovered that Kala and Jode had set Fatboy to activate, with it being impossible to deactivate him now that the countdown had started. Despite his best efforts, The Doctor was finally unable to save whatever was left of Rigby in the hybrid, forcing him to drop the weapon on to the floor of the church where their confrontation was taking place, its destruction destroying the wasps' fragile bond with Rigby and causing his body to collapse. Although unable to convince Fatboy to shut down on his own even when informing him that the weapon wasn't a threat, The Doctor was subsequently able to disarm him by taking advantage of a design loophole; although Fatboy was programmed to defend himself from attempts at disarmament after activation, he was left virtually immobile for the last four minutes of his countdown as his processors devoted all their attention to completing their assigned task, giving The Doctor time to open Fatboy and remove the control rod of the nuclear stockpile. With the weapon destroyed, Fatboy deactivated and Jode dead, Kala departed, The Doctor and her privately agreeing that it would be easier if they didn't meet again.